Home safety is a serious concern for all homeowners. Whether you travel for long periods of time or leave your home unattended for an hour, you definitely need to keep it safe. It is important to take precautions at all times of the day. Moreover, you need to learn how to protect your home, both inside and outside. 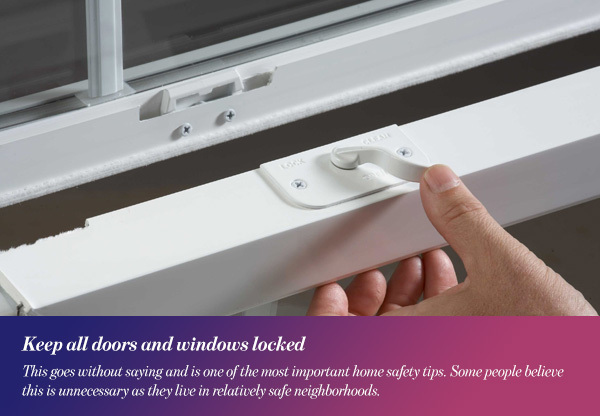 Here are 10 easy tips that will make your home safer. Whether you live in an apartment or separate unit, you need to evaluate your home’s exterior surroundings. 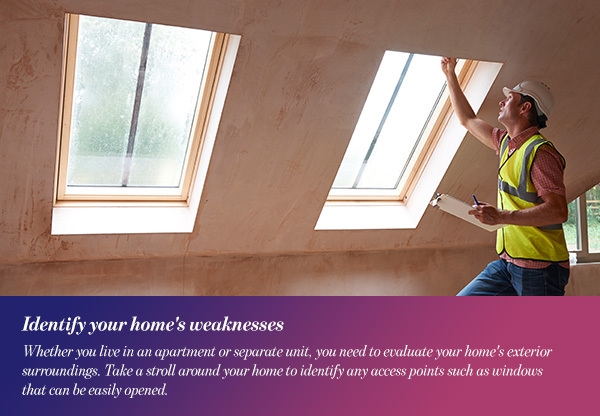 Take a stroll around your home to identify any access points such as windows that can be easily opened. Furthermore, check if any valuables can be spotted from the outside. It is always best to keep valuables like electronics, art, and furniture out of view. 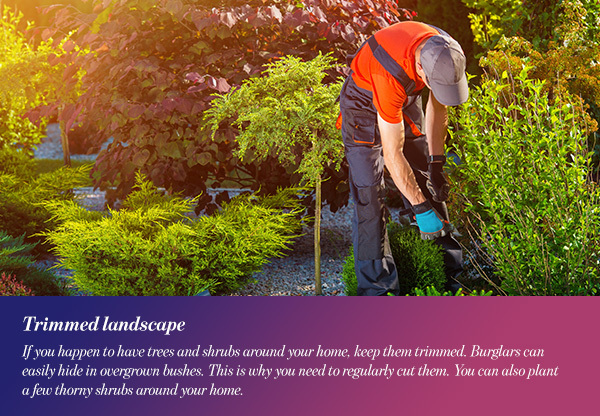 If you happen to have trees and shrubs around your home, keep them trimmed. Burglars can easily hide in overgrown bushes. This is why you need to regularly cut them. You can also plant a few thorny shrubs around your home. If you live in a two- or three-story home, prune the trees to make it difficult for robbers to climb them. 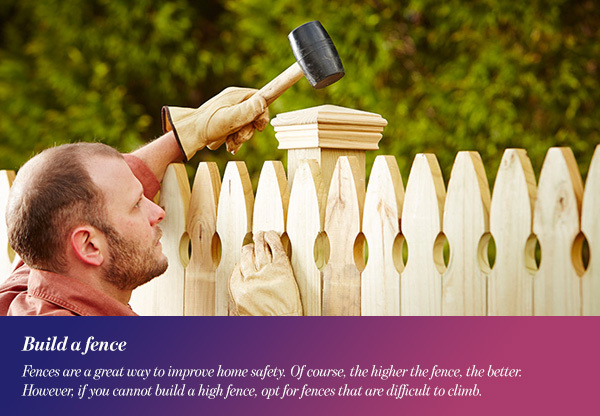 Fences are a great way to improve home safety. Of course, the higher the fence, the better. However, if you cannot build a high fence, opt for fences that are difficult to climb. You can even add sharp, pointed tops to discourage burglars from climbing them. Surely your yard may have pieces of furniture, but try to keep any valuables locked away inside or in the garage. 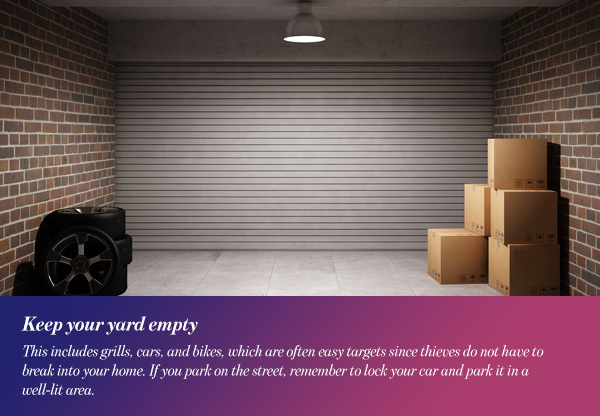 This includes grills, cars, and bikes, which are often easy targets since thieves do not have to break into your home. If you park on the street, remember to lock your car and park it in a well-lit area. Moreover, do not leave toolboxes or ladders lying around outside. They may help thieves gain access to your home. For even better home safety, do not keep toys in the yard as they may indicate that your home carries more valuables. Also, remember to use curtains for basement and garage windows. Do not put your valuables on display. 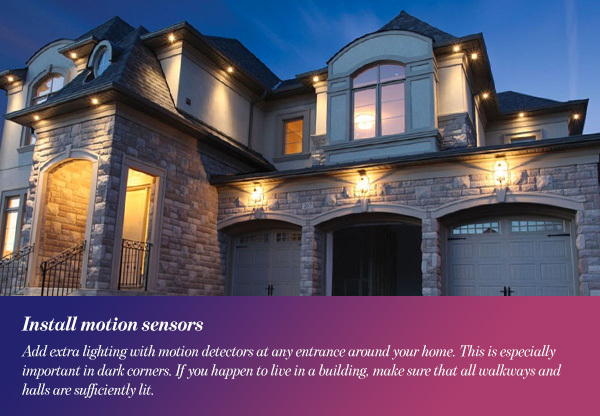 Add extra lighting with motion detectors at any entrance around your home. This is especially important in dark corners. If you happen to live in a building, make sure that all walkways and halls are sufficiently lit. This goes without saying and is one of the most important home safety tips. Some people believe this is unnecessary as they live in relatively safe neighborhoods. However, this is an open invitation for burglars. Keep everything shut and locked, this includes exterior fences and gates. Remember that thieves can spot weak locks so update any locks when needed. 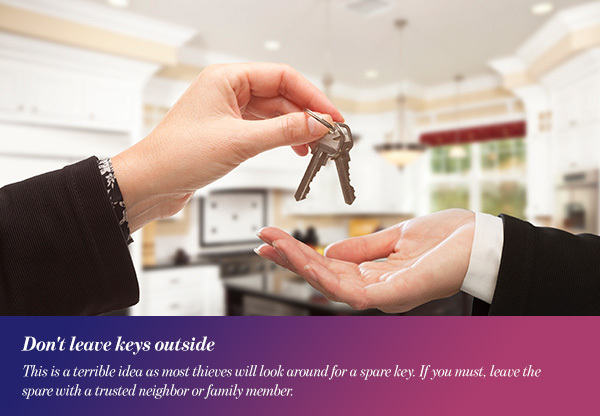 For added home safety, remember to change the locks when you move to a new place. A home safe or lock box goes a long way when it comes to home safety. You can easily store money, jewelry, or any other valuables. However, make sure it is bolted to a wall so that burglars do not simply take it and leave. Do not leave your passcode or combination written and posted anywhere visible around your home. This way, even if a burglar breaks in, they will not have access to certain valuables and possessions. Unfortunately, many of us are guilty of this one. Many times, we leave home keys inside a pot or under the house mat. This is a terrible idea as most thieves will look around for a spare key. If you must, leave the spare with a trusted neighbor or family member. Furthermore, do not label your keys as this compromises your home safety. If you lose your keys, along with your wallet and ID, thieves can easily locate your home and burglarize it. 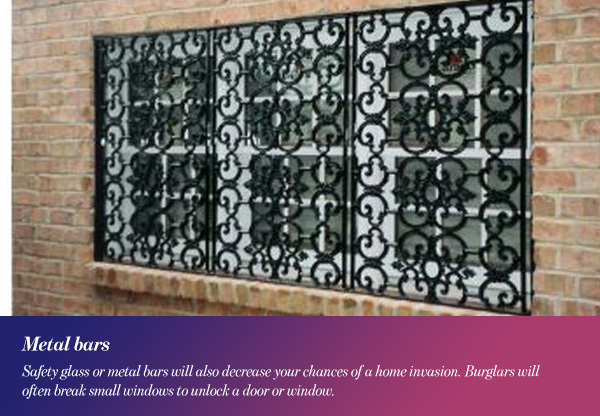 Safety glass or metal bars will also decrease your chances of a home invasion. Burglars will often break small windows to unlock a door or window. With safety glass and metal bars, this will be impossible, so consider taking that step. Home security features vary widely and you can choose the ones that work best for you. 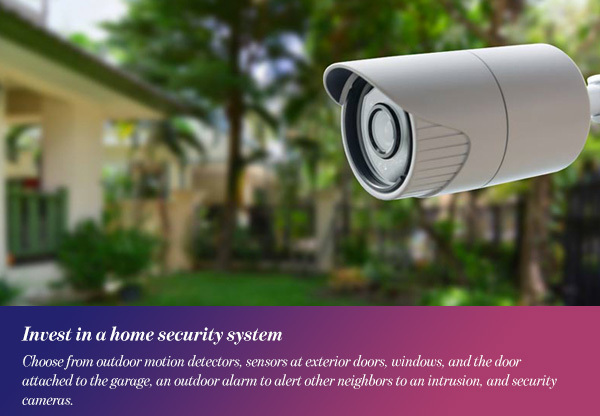 Choose from outdoor motion detectors, sensors at exterior doors, windows, and the door attached to the garage, an outdoor alarm to alert other neighbors to an intrusion, and security cameras. Remember to arm the system everytime you go out and try to avoid false alarms. If you are going on vacation, make sure you take extra precautions. Aside from the previous tips, remember that the whole purpose is to make your home seem less attractive. You don’t want it to be too obvious that you have an expensive car or just bought a new TV. 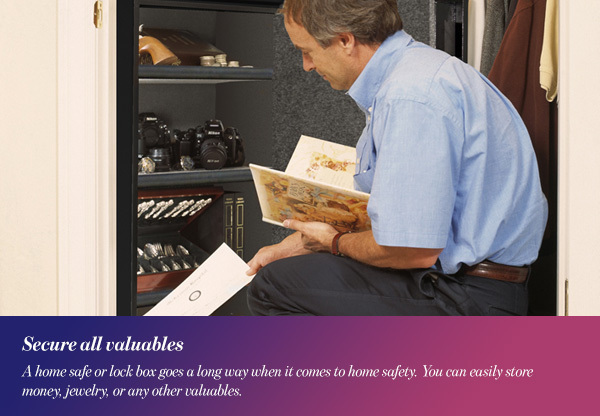 Always try to conceal any valuable items inside your house, out in the yard, and even in your car. Moreover, you should get to know your neighbors. They are more likely to spot a stranger in the area and can alert you to any suspicious behavior. Find out if they have different schedules, which works out in your favor. This way, you can keep a look out for each other’s homes throughout the day. Remember that thieves will usually stake out an area and its homes for a while before breaking in. Most of the time, they are aware of your schedule and know the best time to break in. That is why it is important to commit to proper home safety and decrease your chances of a home invasion.